School Started! And We’re Busy! We are already four weeks into the school year and it’s going great so far! Although, everyday does seem to feel a bit like a marathon! I am up at 6 am to get myself ready for work, and the kids ready for school. It’s 5 pm by the time we get home, then we have lunch boxes to clean, homework to do, baths to give, and dinner to make – all before their 7:45 pm bedtime. When it comes to dinner on busy week nights, I turn to Smithfield® Marinated Fresh Pork for Real Flavor Real Fast. With their variety of marinated fresh pork options, I can have a flavorful dinner on the table in about 30 minutes! This week, I decided to make my family Cuban Pork Sliders. My pork sliders are made with Smithfield Roasted Garlic & Herb Loin Filet, which pack a ton of flavor into each bite! 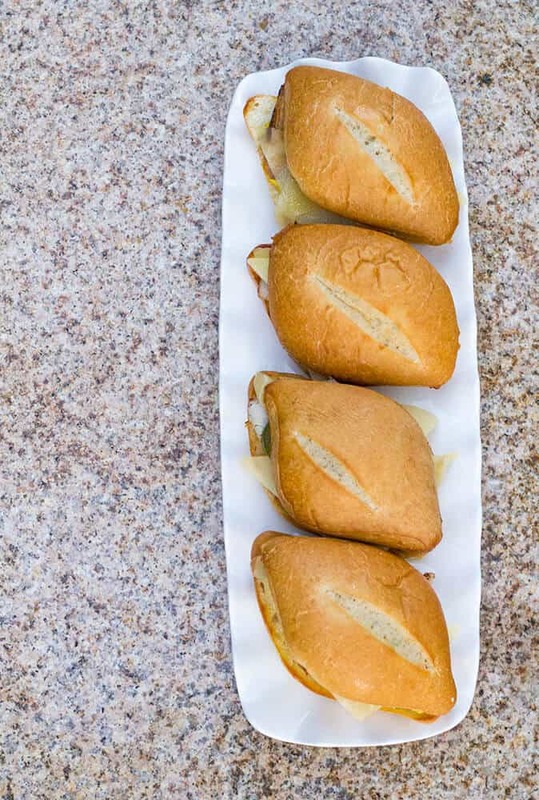 Once cooked, the pork gets layered onto toasted rolls that are smeared with mustard. 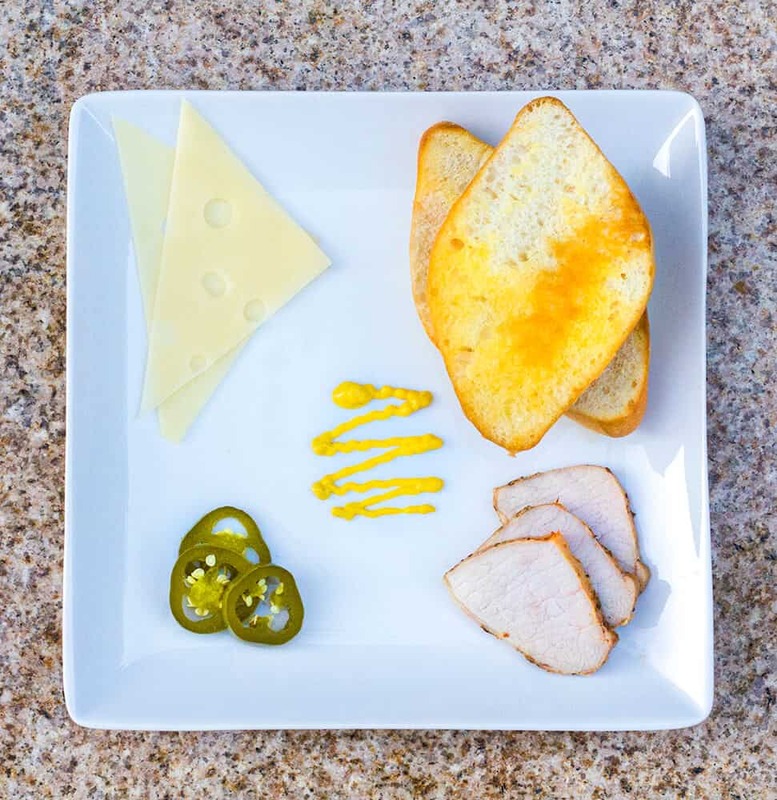 Then a few quick-pickled jalapenos are layered onto the pork (for the adults who like spicy foods) — then a slice of swiss cheese goes on top. 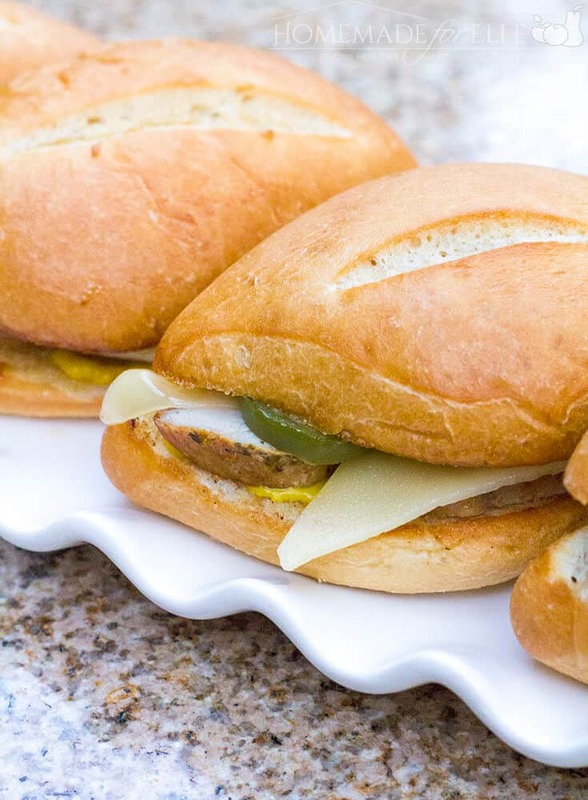 In about 40 minutes, these Spicy Cuban Pork Sliders hit the dinner table! 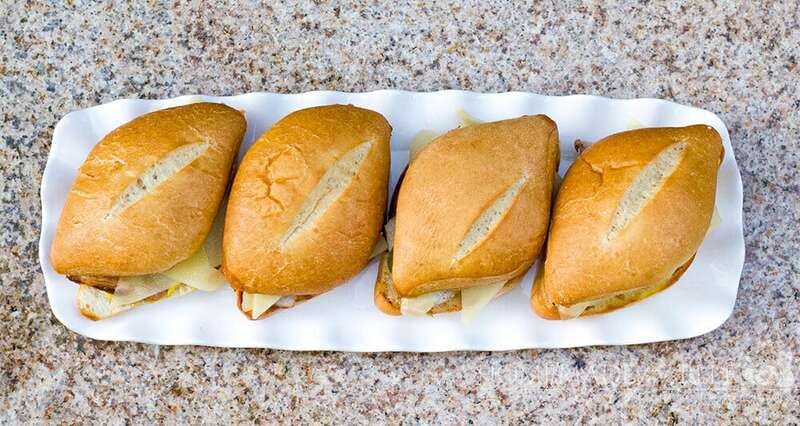 These Spicy Cuban Pork Sliders are definitely in my top 5 favorite sandwiches! They have a wonderful balance of savory and spicy flavors. You can also dice any leftover pork and toss it with cooked noodles & butter for a quick and easy lunch the next day! Preheat oven to 425 degrees. Place pork on a baking sheet, and bake in preheated oven for 30 – 40 minutes, until internal temperature reaches 150 degrees. Once cooked, cut into 1/4″ slices. Meanwhile in a small pot, bring water, vinegar, sugar, and salt to boil. Add sliced jalapenos, and gently boil for 4 – 5 minutes. Remove from heat. Toast rolls, and add a thin layer of mustard on each side. Top with sliced pork, jalapenos, and swiss cheese. If you’re anything like me, you are ready for a weekend getaway! Smithfield® is here to help you and a guest take a luxury trip to Napa Valley! 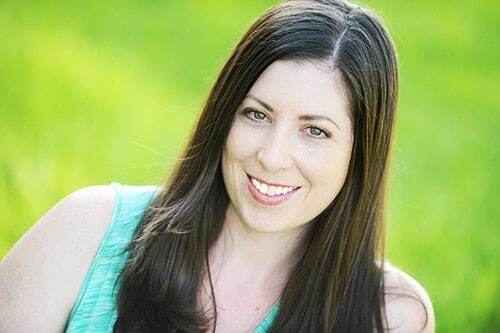 Of course, if you’re familiar with the renowned Napa Valley, you know that a trip there would offer the chance to truly experience Wine Country and everything it has to over! To enter, visit SmithfieldRealFlavorRealFast.com, and share how you get dinner ready in 30 minutes or less – using Smithfield® Marinated Fresh Pork! Did you notice the football-shaped rolls in this post? I picked them up, along with all of the ingredients for this recipe, at Walmart! 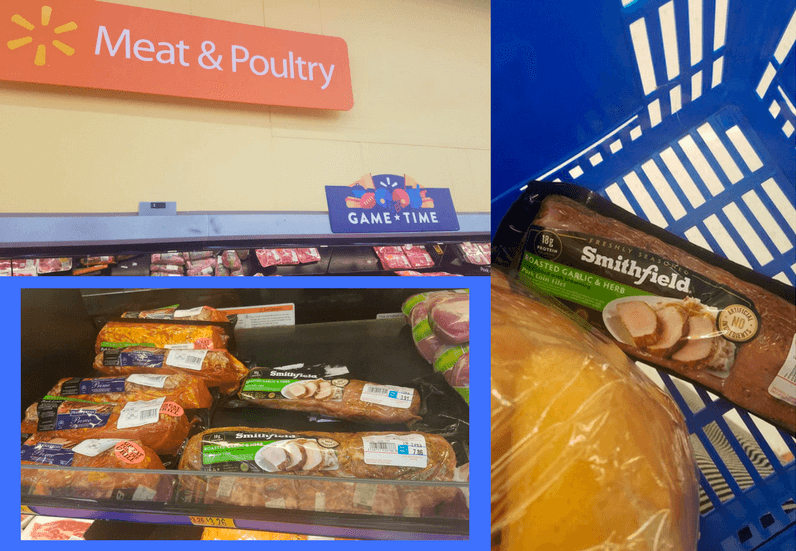 I love that I can get great quality meats at my local Walmart! MOM HACK: Have you tried Walmart’s Free Grocery Pickup? You shop and order online, then drive to the store. A friendly Walmart employee will even bring your groceries out and load them into your car. It’s amaaazing, and so convenient for parents of little ones. Want a printable recipe to hang on your fridge, or to share with family and friends? Here you go! Preheat oven to 425 degrees. Place pork on a baking sheet, and bake in preheated oven for 30 - 40 minutes, until internal temperature reaches 150 degrees. Once cooked, cut into 1/4" slices. Meanwhile in a small pot, bring water, vinegar, sugar, and salt to boil. Add sliced jalapenos, and gently boil for 4 - 5 minutes. Remove from heat. Toast rolls, and add a thin layer of mustard. Top with sliced pork, jalapenos, and swiss cheese. Don’t have time to make this now? No problem! 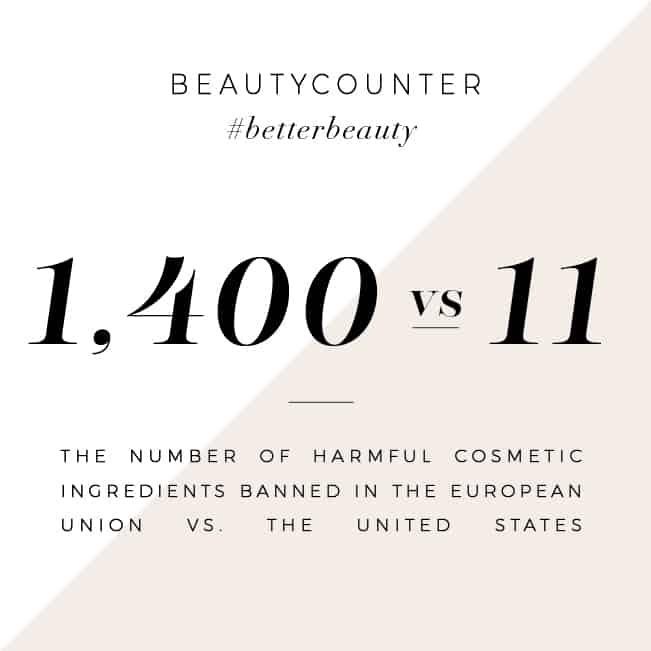 Click on the image below to pin it for later! Don’t forget to visit SmithfieldRealFlavorRealFast.com for a chance to win a Trip to Wine Country, or thousands of gift cards! In all honesty, this dish appears to be delicious. I love pork sliders and so does my family! Not sure about the spicy part, but I can adjust the spices easily. Looks delicious! These pork sliders look delicious! I love that they only take 30 minutes, perfect for last minute meals. That looks so good! I can’t wait to make this. These look ah-mazing! Everyone in my family loves spicy meals. I know they’ll love these pork sliders. 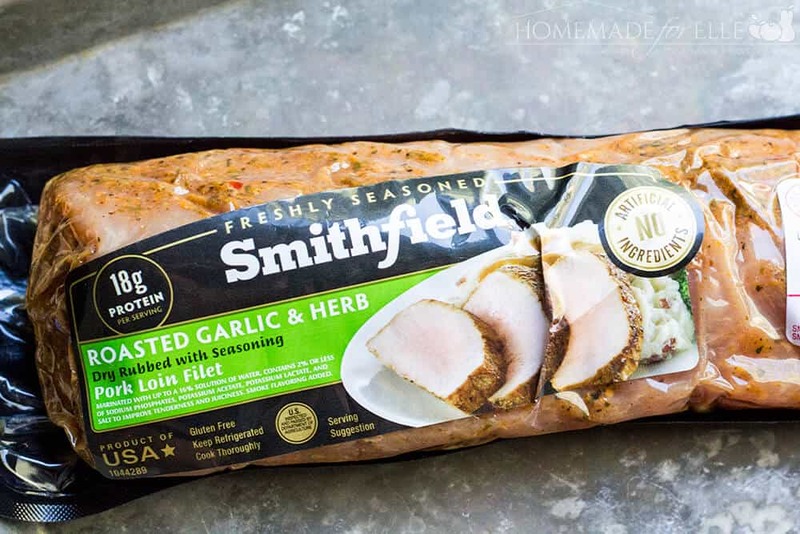 The Smithfield Roasted Garlic & Herb Loin Filet looks super tasty! Your pork sliders also look and sound super delicious and easy to make! This is one recipe I’d be able to get the grand kids to eat. They love sliders of every kind and I love fixing them. I’ve never had cuban pork sliders before so it will be a treat to make them.